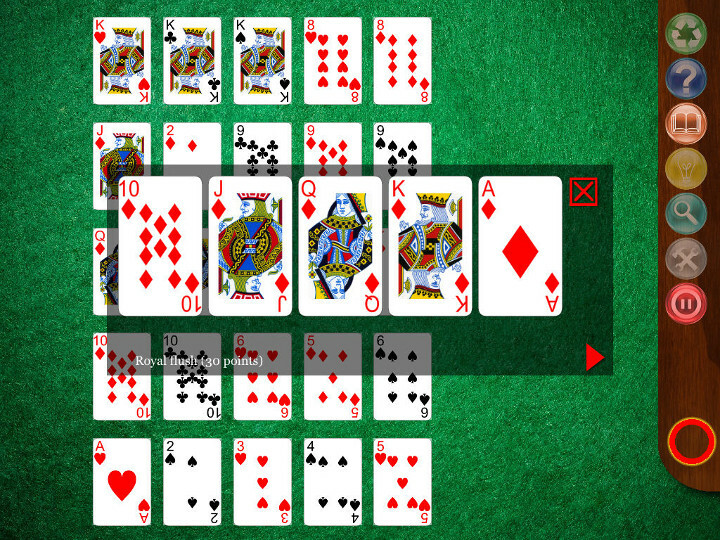 You don't necessarily need to be a poker fan to enjoy Poker Solitaire. Rather, you should see it as an interesting, strategy-focused solitaire game in its own right. Twenty-five cards are dealt at random from a standard deck of 52. These are placed in a pile to the left of an imaginary 'grid' of 5x5 slots. One by one, move the top card from the pile to one of the slots in the grid. In the version included here, once a card has been placed in a slot, it cannot be moved again. This means you need to employ a little bit of thought and strategy when placing the cards! Each row and column of the grid represents a hand of poker. For each row or column, the better the hand, the more it will score. For example, a row or column with two pairs in it scores better than a row or column with one pair. A row containing a straight (or "run", e.g. 2-3-4-5-6) scores more, etc. As you fill the grid, the aim of the game is to maximise your overall score. A "good" score in this version of the game is a total of 45-50.